Wednesday, July 4, 2019 @ 8:00 a.m. 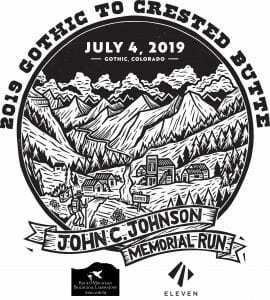 This years marathon is dedicated to the founder of RMBL Dr. John C. Johnson who visited the Gothic townsite for the first time on July 4th, 1919. Join us for the annual Gothic to Crested Butte 1/3rd Marathon, an event benefiting The Rocky Mountain Biological Laboratory. The run begins in Gothic, 8.56 miles north of Crested Butte, Colorado. 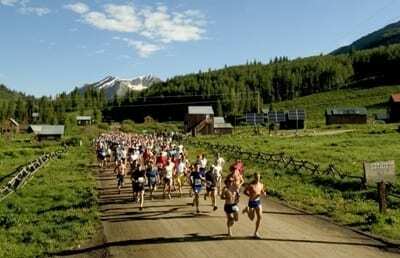 Late Registration: the morning of the event, July 4th, 6 a.m. – 7 a.m. at the Crested Butte Visitor Center – ONLY if the cap of 600 runners has not yet been met. No registration will occur in Gothic. Bib Pick-Up: Bib pick-up will take place at the following two locations. Transportation: Free shuttle buses will depart for Gothic beginning at 6:30 a.m. at the 4-way stop in Crested Butte, adjacent to the Visitor Center (601 Elk Ave.). Strollers can be taken on the bus only if collapsible. No dogs are allowed on the buses! The last bus departs Crested Butte at 7:20! Mt. Crested Butte Shuttle Pick-Up – will take place between 7:00 a.m. and 7:25 a.m. Please wait on Gothic Road, adjacent to the Grand Lodge. Buses WILL NOT pull into the transportation center round-about. Please do not drive to Gothic the day of the race! There is no parking available for race participants! Gear Shuttle: You may leave a bag with extra gear, labeled with your name, in the RMBL van in Gothic before the start of the race. The van will be at the finish line in Crested Butte located next to RMBL Offices at 308 3rd Street. Any gear left in the van after the race will be taken up to Gothic and placed in the Gothic Store to be picked up as soon as possible. Early Starters: Those wishing to start before the 8:00 a.m. start time must inform registrars at bib pick-up. To prevent problems with timing, non-competitive participants will not receive a timing chip on their bib. Restrooms: Restrooms are located at the north end of CB Visitor Center (outside access). There will also be port-o-lets located in Gothic. Results: Will be posted at the finish line at 3rd St. & Elk Avenue, as well as online – link will be posted. Out of town winners should be sure to claim their prize the day of the race. Race awards will not be mailed. Refunds: All registrations are non-refundable. For more information: email racedirector@rmbl.org or call 970-349-7420.